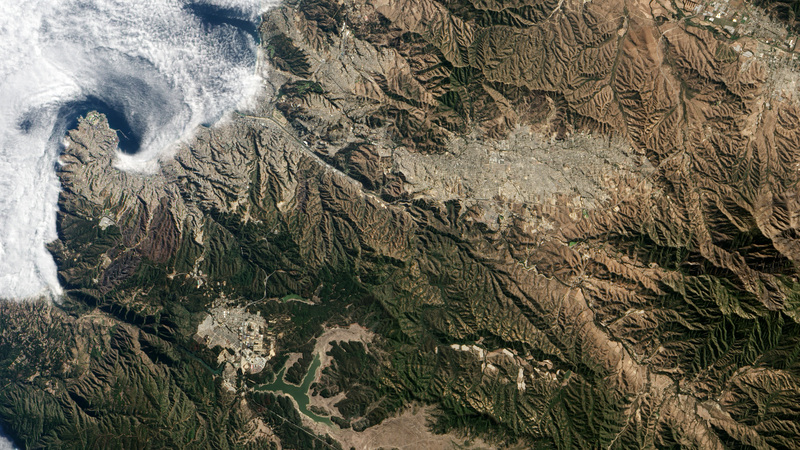 NASA Earth Observatory image by Jesse Allen and Robert Simmon using EO-1 ALI data provided by the NASA EO-1 team. Caption by Holli Riebeek. The city of Valparaiso rises from Chile’s Pacific coastal plain along steep mountains that surround the port like an amphitheater. The setting that makes it picturesque also put the city at risk in April 2014. On the afternoon of April 12, a wildfire broke out in the hills south of the city and quickly moved into densely packed neighborhoods of wooden houses. Steep, narrow roads—or no roads at all—challenged firefighters trying to control the fire. By the time the fire was extinguished, 3,309 homes had been destroyed and 15 people had died. It was called the largest, most destructive fire in the city’s history. On May 4, 2014, the Advanced Land Imager (ALI) on NASA’s Earth Observing-1 (EO-1) satellite acquired these images of the burned landscape. 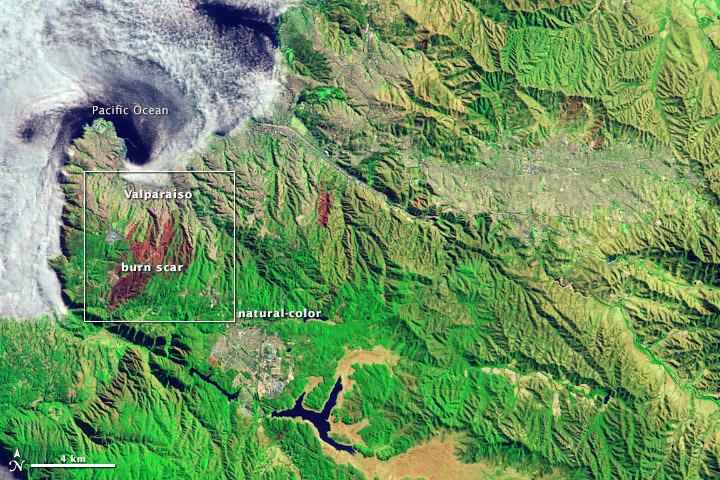 At the top is a false-color image that incorporates infrared light to make a clear distinction between newly burned land and the surrounding landscape. 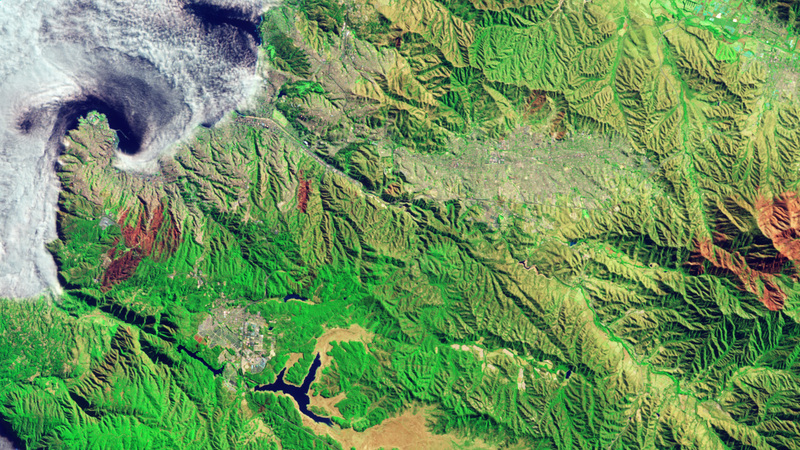 The fire scar is dark red; plant-covered land is bright green; sparsely vegetated land is tan; and the city is gray and purple. The fire burned 965 hectares (2,385 acres), extending down several hills and ravines toward the center of the city. The lower image shows a more detailed, natural-color version of the scene. In this case, the newly burned land is dark brown and unburned vegetation is dark green. The city is white. A highway runs through the burn scar, and pale tan roads within the burned area hint at where homes once stood. Satellite images such as these can help land managers assess both the extent and severity of the burns in a hard-to-reach landscape. 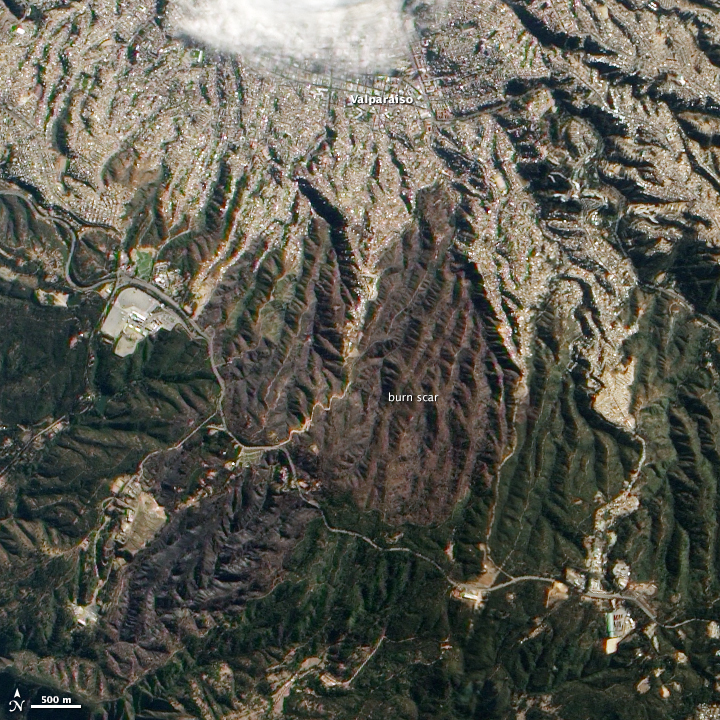 This information can show where measures need to be taken to prevent further damage from landslides, erosion, falling trees, and water pollution. International Federation of Red Cross and Red Crescent Societies (2014, April 15) Chile: Fire – Emergency plan of action operation no. MDRCL010. Accessed May 6, 2014. The New York Times (2014, April 14) After fire, picturesque hills of Chilean port city are left in ruin. Accessed May 6, 2014. Redhum (2014, April) Chile – Emergencia Incendio de Interfase. Accessed May 6, 2014.